Reference number for this case: 16-Oct-54-Strasbourg. Thank you for including this reference number in any correspondence with me regarding this case. The regional newspaper L'Alsace for October 19, 1954, reported that at 09:35 p.m., in Strasbourg, nine people "who were enjoying the warmth of the evening at the bar of the flying club, at the Polygone, also saw the same craft through the night sky from east to west." "Same craft" refers to other observations so far documented elsewhere in this catalog. Another newspaper said it was "a shining machine, having the shape of a melon, and leaving a trace of two meters of white-orange colour, that flew above the area of the Bas-Rhin." After cigars, brooms, barrels, it is now the "melons" that appear in the sky of Alsace. In fact, many people claim to have seen a shining machine on Saturday night, in the form of a melon, and leaving a white-orange trail of two meters, flying over the Bas-Rhin. This has indeed been observed not only in Strasbourg but also Niederhaslach, Haguenau and Wissembourg. Finally, in the Haut-Rhin, people also saw a craft that seems to be the same crossing the Bas-Rhin sky at a frightening speed. It is at 07:30 p.m. that the phenomenon was observed for the first time on Saturday night in Strasbourg. Three people near the EDF plant on the street of Hobsheim saw a craft shining with light and in the shape of a bowler hat who spun in the sky. At 9:35 p.m. nine people were enjoying the warmth of the evening at the bar of the flying club, at the Polygone, also saw the same craft cross the night sky from east to west. The same description was given by a dozen young people in Niederhaslach awaiting the results of the election of the new mayor on the village square. A craft flew over them at 09:35 p.m., at an estimated altitude of very roughly fifteen thousand meters. The assumption that this would be a balloon lit by the last rays of the sun was rejected given the extraordinary speed at which the "flying melon" crossed the sky from one side of the horizon to the other. An investigation was opened by the police. A quarter of an hour before, that is to say, at 09:20 p.m., a flying saucer flew at low altitude, in a burst of sparks, on the Stanislas hospital in Wissembourg. The craft was seen by the local police and residents. Finally in Haguenau, at 07:30 p.m., a round and red machine crossed the sky from north to south, followed by a bright white and orange trail. At 11:30 p.m., another craft was seen. In Masevaux, seven people who saw between 9:30 p.m. and 10:00 p.m. a craft that was shaped like a cigar and was followed by a green trail. From the Hundsrück, the "flying cigar was heading to the Sundel." In Eguisheim, at 10:30 p.m., a few people were surprised by the appearance of a spherical apparatus that at a breathtaking speed and in total silence, crossed the sky in the direction of the Trois-Châteaux. STRASBOURG. -- After the cigars, the brushes, the barrels, it is now the "melons" that make their appearance in the sky of Alsace. Indeed, several people, among them pilots of the flying-club of Strasbourg, claim to have seen Saturday evening a shining machine, having the shape of a melon, and leaving a trace of two meters of white-orange colour, that flew above the area of the Bas-Rhin. This machine is said to have been seen almost at the same hour in Strasbourg, Haguenau and Wissembourg. The "melon" evolved at a high altitude and moved according to some in a south-eastern direction, according to the others in an East-West direction. A similar phenomenon was observed in Niederhalslach (valley of the Bruche). CHAUMONT. -- During more than one hour, Sunday afternoon, the 400 witnesses of the soccer game in Langres could follow the evolutions of an unknown apparatus which was at very high altitude. Some believed that it was a weather-balloon, which, say the others, appears not very probable, for before disappearing, the machine moved in opposite direction of the wind. In addition, in Chaumont, a mechanic, Mr. Auguste Poulot and his three children noticed at the beginning of the night the passage of a flying cigar. DIJON. -- Ten days ago, Mr. André Narcy, aged 47, roadmender, arrived at his work very breathless: "I saw a flying saucer", he claimed. In short, questioned again by the gendarmerie, Mr. Narcy comes to acknowledge that he made up this story entirely to excuse his late arrival at work. - "Whether were created or not a service missioned to gather the existing documentation on this matter and to study the nature and the origin of the said machines. - "Whether the information currently collected and gathered makes it possible to absolutely exclude the assumption of machines piloted or controlled by living beings of unknown species and origin. - "Whether the government has, on the contrary, sufficient information to allot the production of these machines to the industry of a foreign Country. - "Whether in this last case the international agreements signed by France already allowed consultations relating to the use of such machines in a possible conflict. ernational treaties signed by France already allowed consultations relating to the use of such machines in a possible conflict". Sunday, around 15 o'clock, Mr. Soulier, shoe-maker in Vézenobres, was hunting in the commune of Bouquet, close to Alès, when he suddenly heard a noise similar to that of a chain going down at the bottom from a well. Intrigued, he looked up and saw 30 meters high only a machine of cylindrical form going down vertically. This "cigar", of a metallic blue, 5 to 6 meters in height, by 3 meters in diameter, carried four crutches at its base. The craft remained motionless more than one minute, then climbed back vertically to a vertiginous pace. And Mr. Soulier again the same noise of chain heard. A resident of Saint-Privat-de-Vallorgue (the Lozere), absolutely worthy of faith, stated he saw a luminous ball from 3 to 6 meters in diameter, which suddenly rose in the sky while changing color. Mr. Maillet adds that the sphere hovered without any noise and that it left behind a light whitish cloud. After the cigars, the brushes, the barrels, the rugby balls, "melons" are appearing, this time in the sky of Alsace. Several people, including pilots of the Flying Club of Strasbourg, claim to have seen a shining machine, melon-shaped, and leaving a trace of two meters white-orange in color, flying over the area of the Bas-Rhin. It is said this craft was seeing almost at the same hour in Strasbourg, in Haguenau and in Wissembourg. Soccer unthroned by the "saucers"
Sunday afternoon, in Langres, the show was not on the ground, but in the sky. During more than one hour, the 400 attendees of the soccer game managed to follow the moves of an unknown apparatus which was at very high altitude. Some believed that it was a sounding-balloon but, others say, it does not look very likely, because, before disappearing, the craft moved in opposite direction of the wind. The two authors indicate that in Strasbourg in the Bas-Rhin department, on October 16, 1954 at an unspecified time, several people, among them some pilots from the aero club of Strasbourg saw a shining machine having "the shape of a melon and leaving a trace of white - orange color." The source is noted "La Montagne for 10/19/54". "Strasbourg - 67 - evening: no investigation." Further in their book, they note that the time is not known and that the case integrates perfectly in the 09:30 p.m. meteor series. They claim that "the few serious investigators" who had admitted the fact that it was a meteor which had generated this type of observations were the technicians of the scientific office of the Air Force. Luc Chastan indicates that in the Bas Rhin in Strasbourg on October 16, 1954 at an unknown hour "Several people including some pilots of the Strasbourg flying club saw a shining object in the shape of a melon and leaving a trace of orange white color." The website indicates that on 16 October 1954 at 21:30 in Strasbourg, France, "An unidentified object was sighted, but with appearance and behavior that most likely would have a conventional explanation. One object, about 10 feet across, was observed by one witness for a few seconds." In this book, he indicates that the 16th of October 1954 was an eventful evening throughout Alsace, from 7:30 p.m. to 11:30 p.m. with numerous reports of bright balls in different directions, and that observations located around 21:30 were those of a superb meteor, visible that evening from twenty departments of France, according to "Mysterious Objects in the Sky" by A. Michel, Seghers publisher, on page 245, and "La Grande Peur Martienne" by G. Barthel and Brucker, Nouvelles Editions Rationalistes, page 202. He adds that the proximity, a few hours apart, of fireballs with opposite trajectories and perpendicular paths "is, according to the experts, a remarkable phenomenon." Although there is no description of the alleged "craft", it obviously was the meteor of 9:35 p.m. seen widely over France, and discussed by Aimé Michel as soon as 1956. 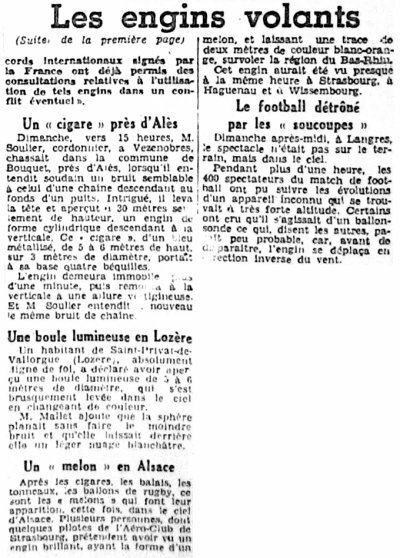 [la1] * "Des soucoupes volantes ont survolé l'Alsace, article in the regional newspaper L'Alsace, October 19, 1954. [lm1] * "Un 'melon volant' dans le ciel Alsacien", article in the regional newspaper Le Méridional, page 10, October 19, 1954. [ml1] * Article in the regional newspaper Le Midi Libre, Montpellier, France, page 3, October 19, 1954. [---] ? Article in the regional newspaper La Montagne, Clermont-Ferrand, France, October 19, 1954. [am1] * "Mystérieux Objets Célestes", book by Aimé Michel, Arthaud publisher, France, 1958. [am1] * "Flying Saucers and the Straight-Line Mystery", book by Aimé Michel, English version of "Mystérieux Objets Célestes", S.G. Phillips publisher, USA, 1958. [am1] * "Mystérieux Objets Célestes", book by Aimé Michel, Seghers publisher, France, page 244, 1977. [fr1] * "OVNI, Premier Dossier Complet des Rencontres Rapprochées en France", book by Michel Figuet and Jean Louis Ruchon, Alain Lefeuvre publisher, France, page 175, 1979. [bb1] * "La Grande Peur Martienne", book by Gerard Barthel and Jacques Brucker, Les Nouvelles Editions Rationalistes publishers, France, pages 204,205, 1979. [---] * "Computerized Catalog", compiled by Luis Schoenherr. 1.0 Patrick Gross December 26, 2009 Conversion from HTML to XHTML Strict. First formal version. Additions [lc1], [ud1]. 1.1 Patrick Gross July 14, 2010 Addition [ml1]. 3.0 Patrick Gross April 29, 2014 Additions [la1], [cv2], Summary.